Android is a mobile operating system (OS) developed by Google. Initially, Android was created by Android Inc., a California-based company that worked with operating systems for digital cameras and mobiles. With the goal of entering the mobile market, Google acquired the company in 2005 and released the mobile operating system Android to the consumer market two years after. As the Android OS was introduced to the market, it gained the support of several smartphone manufacturers, such as Sony, Samsung and HTC, which have all built phones designed specifically for the Android system. This has aided Android significantly in gaining market share, taking over the top position of smartphone operating systems from Symbian OS by 2010. Since then, Android has consistently distanced itself from the competitors, aggressively increasing its market share over the years. In 2017, Android accounted for more than 80 percent of all smartphone sales to end users worldwide. Android is forecast to maintain its leadership in the market, projected to account for about 85 percent of all smartphones shipments worldwide in 2020. Marshmallow, Nougat, and Lollipop are some of the most popular Android versions. Upon the success of the operating system in the smartphone market, Android expanded its operating system to tablets. Android tablets were introduced to compete with Apple’s iPad, a pioneer product in this particular market. Due to the lack of quality applications for Android tablets, Android did not grow as strongly at first as in the smartphone market, but managed to establish itself as the leading tablet operating system in late 2012. Android is forest to maintain its strong market position as the operating system is projected to account for almost 60 percent of the global tablet operating system market share by 2020. The increasing popularity of Android devices has a direct impact on the app store Google Play, which was first introduced under the name of Android Market. 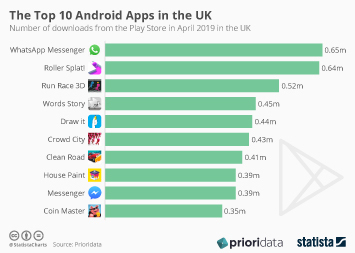 It is now the biggest app store in the world, and has 3.6 million apps available for download in March 2018.